Renata Hohl is an attorney at law specialised in industrial property law with more than 30 years’ working experience. She earned her law degree and a postgraduate degree in intellectual property from the Catholic University of Rio de Janeiro and a postgraduate degree in civil procedure law from the Getulio Vargas Foundation, another top university in Rio de Janeiro. Her practice focuses on trademark law and copyright law, including trademark counselling, registration, protection and enforcement worldwide. Ms Hohl is the manager of the legal department at Di Blasi, Parente & Associados, a Brazilian IP law firm based in Rio de Janeiro. In recognition of her expertise and wisdom, she frequently serves as a mentor to her team. She is also an experienced lecturer and professor for trademark intermediary courses at the Brazilian Association of Industrial Property Agents. Ms Hohl has been recognised as an IP Star. She is fluent in Portuguese, German and English and can also speak basic French and Italian. 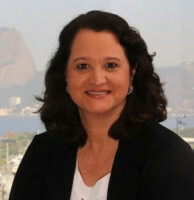 She has been in Di Blasi Parente & Associados since 2007.